As they have done for much of the season Fiorentina rotated their shapes for the different phases of the game. Out of possession they played in a very narrow 4-2-3-1/4-4-1-1 shape whilst they acted in a 3-2-4-1 when in possession. Within these base shapes they showed several interesting mechanisms that led to an interesting performance. For much of the game Fiorentina’s pressing movements were very impressive. Starting in a narrow 4-2-3-1/4-4-1-1 they effectively destabilised Juve’s build-up and managed to force several turnovers of possession, at times in very dangerous areas. Collectively the team were positioned strongly to make penetrating passes extremely difficult for their opponents. These base positions and the general movements hinted very strongly at an intention to prevent the Allegri’s men from building in central areas. Fiorentina picked their moments to press very wisely utilising a number of triggers from which they sprang into action. Aside from these moments that they often appeared fairly passive against the away side’s build-up while they initiated their pressing traps and waited to move into the next phase of the traps. From the front it began with the roles of Ilicic and Kalinic. Kalinic would press Bonucci (the central centre back) from an angle that allowed him to use his cover shadow to block passes into midfield. Illicic meanwhile was tasked with situationally marking Lemina who was often Juve’s deepest midfielder to restrict another central option in the away side’s build-up which was also important in the next stage of the trap. Bernadeschi and Tello were positioned in their respective half spaces which gave Sousa’s men strong central control in their pressing. This narrow positioning also helped them deny diagonal routes of progression into Khedira and Pogba. Furthermore their central positioning gave them a relatively short distance to Rugani and Barzagli the side backs which meant they could create access to them fairly quickly. Badelj and Valero in midfield displayed a dual orientation in their pressing movements. Primarily they occupied positions that allowed them to screen vertical passes into the likes of Dybala behind them. However they were also keen to maintain coverage of their direct opponents in Pogba and Khedira. They would thus mark Khedira and Pogba tightly until they moved too far out of their starting positions which would remove Badelj’s and Valero’s ability to block passes into the 10 space. As mentioned above Fiorentina’s base positions displayed their aim of forcing a wide build-up from Juventus which was their major pressing trigger. Once Sousa’s men achieved their initial aim their traps moved into the next stage. When the ball was played into wide areas Fiorentina became very man-oriented on the ball near side to create the access to regain possession. The ball-near wide player would press the ball carrying side back using cover shadows to prevent the pass into Pogba or Khedira depending on the side the ball was on, the ball-near central midfielder would support in this effort by marking the aforementioned midfielder tightly. Kalinic would move into the lane between the ball carrying side back and Bonucci to direct the Old Lady’s build-up to Fiorentina’s strong side where they had strong access. Ilicic maintained his coverage of Lemina and the far side wide player would orient themselves to Juve’s ball-far wide midfielder. This allowed Fiorentina’s ball-far central midfielder to be more position-oriented in order to provide an element of stability in case of the press being beaten. The ball-near full-back would push up diagonally to press Juventus’ wing back aiming to prevent them from turning out and beating the press. With these intensely man-oriented movements Fiorentina ensured every pass Juventus attempted was done under pressure which gave them a higher chance of regaining possession. This was particularly effective after a number of passes had been made as the pressure meant the quality of these passes eventually reduced. The number of turnovers they managed to force helped them establish an early dominance of proceedings. With Lemina often unavailable to receive passes Pogba began acting far deeper in the left half space to provide an alternative route for Juventus to build-up. However Tello and Badelj shared the responsibility to limit his influence quite well. When he dropped deep Badelj would pass him on to Tello whose positioning in the half space meant he did not have to move far to press Pogba. However there were one or two moments where Pogba’s dropping movements broke the home side’s access as he dropped out of Badelj’s zone and Tello was occupying a deeper and wider position in their mid-block 4-4-1-1. In possession the home side rotated into a 3-2-4-1 shape with Alonso moving out to act as a winger on the left and Bernadeschi drifting in to occupy the left attacking midfielder position. 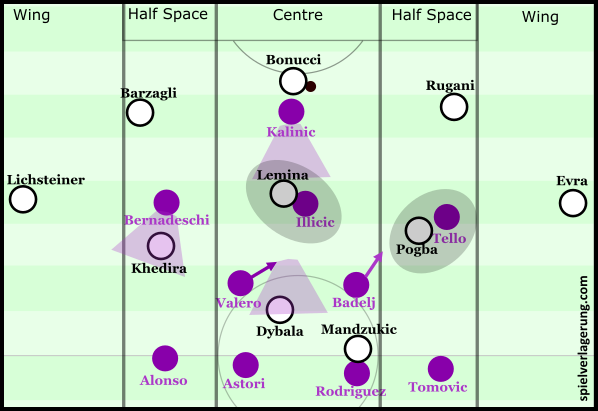 With the three centre backs generally covering the width of the half spaces, two central midfielders and two attacking midfielders acting in their respective half spaces Fiorentina were positioned to build and progress through the centre and half spaces. Fiorentina’s zonal occupation and base positioning in possession were quite impressive. They displayed good vertical and horizontal staggering and their strong occupation of the 10 space affected Juventus’ positioning. By occupying more than one player each Fiorentina’s attackers gave their deeper players time on the ball to circulate and probe. The two attacking midfielders were integral to their possession game. They were positioned behind Juventus’ midfield line and were tasked with offering diagonal and vertical passing options to the defenders and midfielders. When the home side managed to play behind Juventus’ midfield line and into the 10 space they used some effective lay offs, combinations and rotations that helped to create some dangerous situations. When a vertical pass is made a competent opposing defence will build high resistance to it, pushing up to prevent the receiver from turning with the ball. It is therefore often necessary to lay the ball off to evade this inevitable pressure, and the structures the home side had around the 10 space gave them the ability to do this effectively. With Bernadeschi, Kalinic and Ilicic often in close proximity they could offer lay off options and combination opportunities to help the home side secure possession in the 10 space. Once they had used their layoffs to consolidate possession in the 10 space they used combinations and rotations to directly threaten Juventus’ back line. However for large periods of the game the importance of the 10s was not a positive as it led to long circulation periods whilst they tried to create access to the 10 space. Part of the issue was a lack of effective movement to evade the cover shadows of Juventus’ midfield trio. The 10s were often too static or if they were on the move they lacked the disguise to make these movements effective. Without effective movement ahead Sousa’s back 3 circulated the ball several times with a general lack of viable options in advanced areas, the circulation was thus far too slow to trouble Juventus. Furthermore on the occasions where they moved wider to escape the covering of Juventus’ midfielders they lost the connections between themselves that were vital in avoiding pressure. In these situations they were pitched against one of Juventus’ defenders in a wider area without the ability to combine with team-mates. With none of these players particularly excelling in such isolated situations, this was quite an unstable way to build attacks. This lack of effective movement in addition to their general reluctance to play into congested areas harmed their ability to manipulate Juventus’ defence and take advantage of their structures in possession. Some of Fiorentina’s better moments came when the side backs advanced aggressively with the ball, what this did was commit one of Juventus’ midfielders thus reducing their capability to cover the attacking midfielders. For all Fiorentina’s territorial dominance they struggled to create the chances to match and press home this advantage. This was in no small part due to the strong defensive system they came across from Allegri’s side. Juventus’ system used an interesting mix of positional reference points. For much of the game, particularly late on in the 2nd half they operated in a 5-3-2-0/5-3-1-1-0 shape as Dybala was positioned deeper than Mandzukic. The midfield 3 were quite position-oriented, they were not keen to apply pressure to opponents and were very reluctant to move too far out of their base positions. Instead they held positions from where they could block passes into the likes of Ilicic, Kalinic and Bernadeschi with their strong use of cover shadows. The 3 centre backs however were far more man-oriented, they maintained their base positions while Fiorentina were building in deep areas but were geared towards maintaining access to Fiorentina’s players roaming between the lines. When those players received the ball Juventus’ defenders would push up and mark them tightly aiming to force them into playing backwards. In addition to the covering from the midfielders and the man-orientations from the centre backs Juventus maintained good vertical compactness. With these aspects Juventus made it very difficult for Fiorentina to break through centrally. Typical scene depicting Juventus’ defensive scheme. Juventus however were not simply content to deny Fiorentina access to the 10 space, with their 5 man back line Juventus could cover large amounts of space horizontally meaning the wing-backs could keep a favourably short distance to Tello and Alonso. This was particularly helpful as it restricted Fiorentina’s ability to make their switches effective. Whilst they could still create isolations for their wide players, they lacked the space, upon receiving, to generate momentum and attack Evra or Lichsteiner at speed. This was certainly a somewhat fortunate win for Juventus with Fiorentina having a perfectly fine opening goal chalked off amongst other dramatic events. They were however in control from a defensive point of view for most of the game with their strong defensive system. They also showcased their incredible mental resolve in regaining the lead minutes after a mistake from Bonucci gave the home side an equaliser. With Napoli’s late loss at Roma on Monday afternoon, Juventus have been crowned champions of Italy for the 5th consecutive season. Fiorentina can feel slightly aggrieved with the defeat however they were not particularly impressive themselves. They need to address some of the issues detailed above that lead to a stale possession game which has reared it’s head on several occasions through the season. the non-given opening goal was really great..! the outcome would have been surely different if the goal would have been given.. I wonder if serie a do have a similar ‘bayern problem like the german bundesliga?